Shuvo Shuvo Shuvo Din, Aj Tomar Jonmodin.Mukhe Tomar Dipto Hashi Ful Futece Rashi Rashi.Hajar Fuler Maje Golap Jemon Hase,Temon Kore Bondu Tomar Jibon Jeno Sukher Shagore Vase. Tomar janya prarthana kori 12 maas Ananda 52 saptaha Khushi, 365 din Saphalya 8760 Ghanta Suswasthya, R 52600 min Soubhagya ! Subho Janmadin ! Khushir Akase Pal Tule Jeo Chirodin,Hasir Gane Sodh Hoye Jabe Joto Rin.Alor Poroshe Vor Hoye Jabe Ei Rat,Konodin Chere Diona Ei Bondhutter Hat. .*””Happy Birthday””**. Shuvo Rojoni Shuvo Din, Samne Asche Tomar Jonmodin,Jonmodine Ki Dibo Tomay , Ek Tora Golap Ful R Ek Buk Valobasha Chara R Kichu je Nai. Tor Janya Bhalobasa, Lokkho Golap Jui, Hajar Loker Bhire Amar, Thakbi Hridaye Tui. Happy Birthday! Grishmer fulguli, Vorshar onjoli, Shoroter gitali , Hemonter mitali,Shiter pithapuli, Boshonter ful-koli,Emni kore vore thak tomar jiboner dinguli..………Suvo Jonmodin……. আপনি সাফল্য এবং আনন্দ আপনার জীবনে এগিয়ে তবেই! 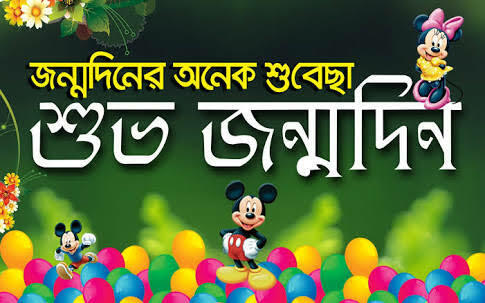 শুভ জন্মদিন!! Diner seshe bolchi bote subho jonmodin..kintu tomar kothai shudhu bhabchhi saradin ! Happy birthday!! aj tumar jhonmo din ,ki debo bolo upohar ?Hridoy chara debar moto kichu nei to amar ,aj jhonmo dine tomar, ei gan dilam upohar. নতুন সকাল , নতুন দিননতুন করে শুরু, যা হয় না যেন শেষ.জন্মদিনের অনেক শুভেচ্ছার সাথেপাঠালাম তোমায় এই এস এম এস !শুভ জন্মদিন !! Jei Din Surjo Utheni, Sei Din Ful Foteni. Karon Jonmo Din Chilo Bole.Din Ta Chilo Sudhu tomar. Amar Maje Lukiye Ache Sei Din Tir Sriti.Ja Proti Bochor Sara Jagay Amar Mone. Happy Birthday my dear. Aar ekta bochor ese gelo,Bere jabe R ekta mombati,Kal o chilam aaj o achiTomar janmadiner sathi !Happy Birthday ! Ar ekta bochor ese gelo, Bere jabe R ekta mombati,Kal o chilam aj o achi Tomar jonmo diner sathi ! Shobaito ful diye wish korbe. Ami na hoy hridoy diye korbo.Keu mukhe bolbe abar keu gift dibe. Ami na hoy sms diye bollam.“Happy Birthday”. 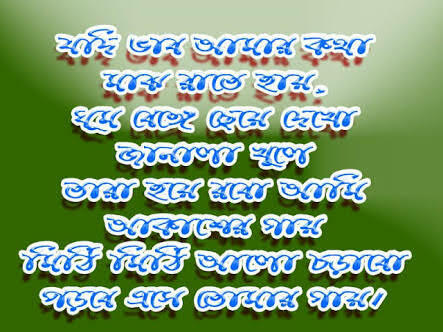 Janmodiner shubechcha, priti R bhalobasa, Pouchhobe tomar kache, amar ei asha. Ei kobita pore tumi hasbe hoyto, ke ba jane Udyeshya saphal hobe, jadi ei sms ekta hasi tomar mukhe aane ! Shubho Janmadin ! Bhabchi ami, bhabchi anek Mone porchhena, Keno aaj special din Bojhai jachchena ! ; ; Achcha, tor janmadin ese geche aaj-i ? Subho Janmadin janai toke Hatachchara Paaji ! Tor janno bhalobasa, lokkho golap jui, Hajar loker bhire amar, thakbi hridaye tui. Shubho jonmodin ! Diner seshe bolchi bote subho jonmodin ……. Kintu tomar katha-i shudhu bhabchhi saradin ! Jonmodiner shubhechcha ! Muche Dao Purono Bedona, Khule Dao Moneri Janala.Vule Jao Bethar Din guli, Muche Felo Chokher Pani.Jhore Jak Dukkho Durdosa, Mone Jagao Shob Notun Notun Asa..*””Happy Birth Day 2 U””*. Congrats on your birthday day! May it bring you all the joy, laughter and love you wish for! Darun dintay janai ovinondon, colar pothe souvaggoban theko, agami jibonta anondomoy hok ei asha kori, aj dinta valo vabe upovog koro. Shuvo Jonmodin. এই দিনটা আসে যেন বারবার বারবার ফিরে, যেন অনেক স্বপ্ন দেখতে পারি তোমায় আমি ঘিরে. হ্যাপি বার্থডে !! আজ বাতাসে সুবাসিত স্নিগ্ধতা, পাখিরা সারি সারি গাইছে গান, প্রকৃতি নতুন করে হয়েছে রঙিন, ফুলেরা সব ফুটেছে বাগানে, আজ আমার সবচেয়ে প্রিয় মানুষের জন্মদিন.... "শুভ জন্মদিন"